The Central Bank van Curacao en Sint Maarten, under the authority of the Netherlands Antilles, has issued (August 4) new silver and gold coins paying homage to one of the Netherlands’ wartime heroes on the occasion of the anniversary of his 100th birthday. 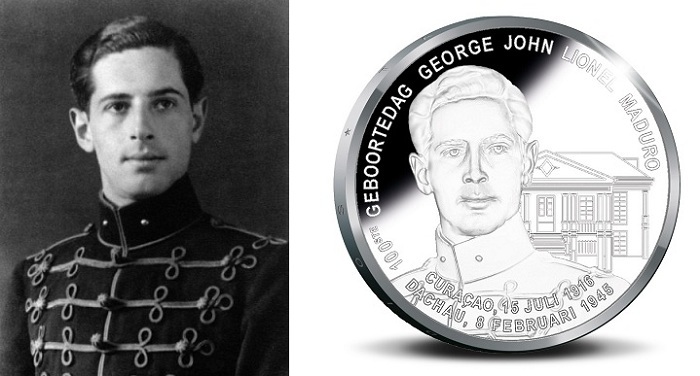 George John Lionel Maduro (1916 –1945) is remembered as the only Dutch person of Antillean descent to have been awarded (posthumously) the Knight 4th-class of the Military Order of William, which is the oldest and highest honor of the kingdom. Maduro was of Sephardic Jewish descent and was born on the island of Curacao in the capital city of Willemstadhad, but came to the Netherlands to study law before the outbreak of the Second World War. When Germany invaded the Netherlands on May 10, 1940, Maduro was serving in the Dutch Armed forces and had been appointed to second-lieutenant-reserve in the Dutch Cavalry by royal order. At the outbreak of the Battle of the Netherlands, he was quartered with the Dutch hussars in the Hague as a reserve officer. Under Maduro’s command, Nazi ground troops stationed in Rijswijk were defeated and parachutists were captured. However, on May 15, upon the surrender of the outnumbered Dutch military, Maduro was captured by German troops and jailed in a local hotel in the town of Scheveningen. Maduro was released a half year later, and when Nazi occupation forces required that all Jews wear the Star of David as a means of identification in public, Maduro refused to do so and joined the resistance movement. He became active in smuggling Allied pilots into the United Kingdom via neutral Spain, but after many successful missions he was captured by Nazi forces and placed in jail again. Maduro escaped this confinement as well and was able to re-join the Dutch resistance. During one of his last missions he was betrayed by a Belgian collaborator and captured once again, this time by the Gestapo. As the Gestapo were aware of his successful escape from jail previously, he was interred in a prison in the city of Saarbrücken in Germany. He was then transferred to the Dachau concentration camp, where in February 1945, barely three months prior to the liberation of the camp by American troops, Maduro tragically died of typhus. It is presumed that he is buried in the cemetery of the camp along with countless of other victims of the conditions of this notorious camp. Aside from being posthumously awarded the Military Order of Willem, George Maduro has had a street named after him called Maduroplein in Scheveningen, the Hague. In addition to this street, there is Madurodam, a miniature park and tourist attraction also in the Scheveningen district of the Hague, which is home to a range of 1:25 scale model replicas of famous Dutch landmarks, historical cities, and large developments. The park was opened in 1952 and has since been visited by tens of millions of visitors; proceeds from the park go to various charities in the Netherlands. The coins are identical in design and include a front-facing portrait of Maduro based on a photograph believed to have been taken of him in early 1940. He is dressed in his formal uniform and looking in a right-angled direction. In the background is an image of his birthplace in Willemstad. Text included in the design reads GEORGE JOHN LIONEL MADURO along the top half. Below the portrait are his dates of birth and death. The reverse side includes the crest of the Netherlands Antilles, along with the denomination and year of issue. The coins are encapsulated and presented in a deluxe case with a certificate of authenticity. The Royal Dutch Mint is now accepting reservations for purchase for immediate delivery. For more information on these and other coins issued by the Central Bank van Curacao en Sint Maarten, please visit the Web site of the Royal Dutch Mint. Sales and dispatch are limited to European destinations only.